Growing up Catholic, to become an adult in the church one must go through the sacrament of confirmation. This is when most Catholic youths research a Saint. I picked Saint Joan of Arc. 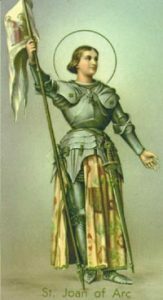 She was the badass of all female saints – a pig farmer’s daughter, age 14, and led her country to battle. She had not one saint visit her, she had four. But now that I am older I don’t relate as much to her. I still have her fiery side of a soldier, but I have had to learn to pick and choose my battles. I wonder how the great Joan would have handled war if she had rent and bills to pay. I wasn’t burned at the stake for my life choices and now I have other issues to deal with. Patron saints are beloved to Catholics. St. Nicholas is the patron saint of newlyweds; St. Lawrence is the patron saint of chefs. 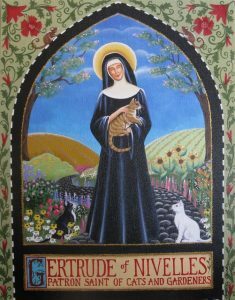 I joke that St. Gertrude of Nivelles, the patron saint of cats and those who are afraid of mice, should be my new patron saint, or St. Rita the patron of impossible cases. Still, I love the concept of these saints and what they represent. Catholic art is treasured to me. It is part of my youth, culture, and tradition. 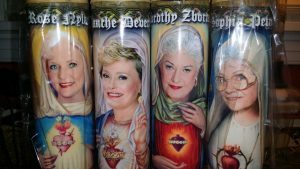 No doubt that you have seen some of these candles. By now they have become part of pop culture. There are candles on sale through Etsy.com and on Superstarcandles.com. 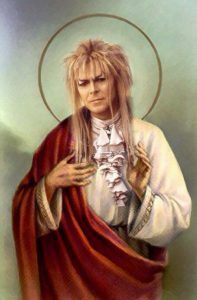 You can find images of David Bowie, Beetlejuice, Cindy Lauper, and all members of The Golden Girls. Friends have given me many catholic gifts that some may consider sacrilege but I don’t care. Imitation is the highest form of flattery. 2016 has been a difficult year. Not just for me, but for a lot of people. We have lost so many celebrities who have only brought hope and love to our society; Carrie Fisher and Debbie Reynolds are just two of the many to shape my Generation X life. To describe my 2016 in one word it would be patronizing. However, this year has also had many silver linings. I became part of the Jade Umbrella team who I love, I actually have been exercising regularly and am in the best health of my adult life, and my husband and I fall deeper in love with each other no matter how hard life has been. America has gone through its own ups and downs. No matter where you fall on politics, most Americans agree that we need more jobs, more peace, and safety for all. So For 2017, I am picking our confirmation saints for the year; to help us with a positive attitude and set the tone for the coming New Year. St. Veronica was not on my 17-year-old radar when I made my confirmation. She is not mentioned in the Bible although being alive at the time. She is a saint for just wiping the face of Jesus. An act that did not seem that significant to me when I went through my own confirmation. 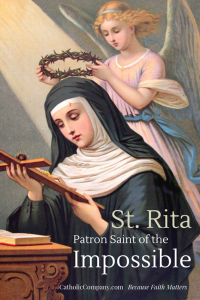 Now, I find her to be the most unpretentious saint providing the greatest act of compassion. This is how we need to treat our country – with compassion! St. Veronica did not change the fate of Jesus and we cannot change the fate of anyone, but we can be there with a box of Kleenex and box of wine and simply wipe away tears of anyone suffering. Our coworkers, neighbors, and perfect strangers – all need your compassion as we ring in the New Year. Channel your inner saint in 2017 and let’s make great things happen! I can’t sit back and chill on Christmas when there is a debate about the movie Die Hard being a Christmas movie or not! Everyone has their own thoughts about what makes a great Christmas movie. We at Jade Umbrella all have our own favorites and unfortunately for Die Hard – it didn’t make the cut. Not because of any twitter debate about the authenticity of its being a Christmas movie, but because we have a pretty good list going for us already. Our list, in random order are: Bridget Jones Diary, White Christmas, Christmas Vacation, Bad Santa, The Grinch (both versions), The Holiday, The Family Man, Nightmare before Christmas, Four Christmases (So bad but so good), The Family Stone, Elf, A Christmas Story, Krampus, Gremlins (I stand by it being a Christmas movie and so does Google), Harry Potter And The Goblet Of Fire (Yule Ball for us Potter fans), Yogi’s First Christmas, Six Weeks (it’s a tear jerker), Hallmark’s The Good Witch’s Gift, Lifetime’s Grumpy Cat’s Worst Christmas Ever, The Christmas Ornament, Home Alone, When Harry Met Sally, and Love Actually. These are just some of the suggestions we have for you, but let’s get back to that debate! Why not let someone claim Die Hard as their favorite movie? Who are we to judge? Somehow the Christmas police came out to arrest anyone that tried to use Die Hard as a favorite Christmas flick, and I am here to put that debate to an end. Christmas has many traditions. If your Christmas tradition is to watch Die Hard, that makes it a Christmas movie. I do not care if the release date was July 15, 1988 (as was Die Hard). I do not care that there is not any centralized holiday message of love, joy, and peace on earth (we have plenty of those already). I do not care that there is a lack of snow (I’m in flip-flops in southern California as you read this). It has Christmas elements. It is set on Christmas Eve at an office holiday party. John McClane is not trying to be the next George Bailey. John McClane has his own ways of helping others. 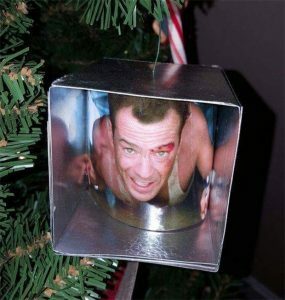 If you need further evidence, just Google “Die Hard Christmas” and you will be flooded with the evidence, instructions on how to make your own Die Hard Christmas ornament, and many justifications to its Christmasy authenticity. The ornament alone is reason enough I’d add it to my own list. Being in public relations, we know how to survive pretty much anything life throws at us. But the world of Politics has shocked us to our core. The 20th Presidential election has exposed the ugly in both political camps while the media has exposed the most random and horrible acts of violence. This does not represent us. We do not believe that is what our society is; there has to be some silver lining coming from this election. (No Millennials, it’s not you getting days off from college and spending time drinking hot cocoa in crying rooms with coloring books on college campuses around America. Somewhere in cyber land, the humble safety pin has emerged as a new symbol for us to unite. Somehow this small piece of metal has become a sharp distinction of who will stand up for anyone feeling unsafe or discriminated against. It does not matter who you voted for. We are still the same country that elected President Barack Hussain Obama…Twice! On December 1, 1955, in Montgomery, Alabama, a seamstress got off of work as many of us do today. She was tired and taking public transportation home. How many of us take Uber, Lyft, or the Metrolink home from work too? 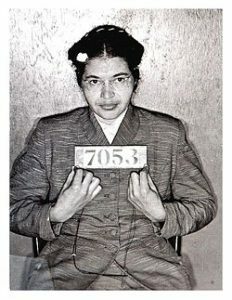 This woman, Rosa Parks (I’m sure you have heard of her), was bullied out of her seat and arrested. There was no one around at that time with a safety pin that was willing to stand up for her. At least not anyone who was not equally intimidated as well or willing to pay the price she paid for standing her ground. How could history have changed if someone did stand up with her? Not just other African Americans either; someone else – someone who would have been willing to get arrested beside her. For a society that considers itself more evolved, consider the outcome today. It is not out of the ordinary for someone like Rosa to not get arrested, but someone would have likely added live Facebook video, gotten arrested for recording, and then shot for being held in contempt of that officer. We live in a country where we have the freedom of speech to start speaking out and making others feel safe. No one should ever feel as alone as Parks did on that long evening. We should never let anyone feel that way now. It is a sad fact that the squeaky wheel gets replaced first. Sometimes silence is more powerful. And that is where we at #TeamJade leave you. Pin that safety pin to your hearts. We may be silent but we will be deliberate. Deliberate with our vote, with our thoughts, with our actions. 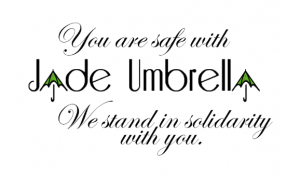 We will stand in silent solidarity with anyone who feels threatened so no one has to be alone.